Sunday is my second favorite day of the week, Saturday being the first. On a typical Sunday morning, everyone is relaxed, everyone gets up a little later than usual, even the little one. We go through the same routine, the moment Berto opens his eyes, he wonders out loud what would be his menu for the day. I often wonder how it is that while the idea of going to the market and cooking for our family is such a torture for me, he relishes every moment of it. 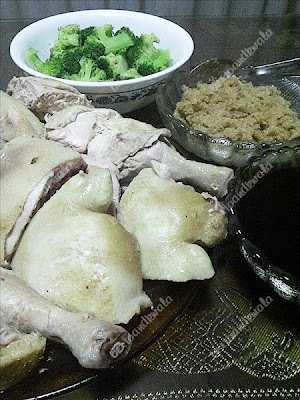 One Sunday he decided to try his hand at cooking Hainanese Chicken again. His first attempt wasn’t too successful. Even after more than an hour of boiling, the chicken still was bloody inside when sliced. This didn’t make the dish too popular especially for my dad who shared his opinion with all the good intentions in the world (“the chicken seems still lacking a few more minutes inside the boiling pot”). Disheartened, Berto didn’t try to cook this dish again… until recently. Preparation: Wash chicken and be sure to remove excess fat. Rub the inside of the cavity with salt. Mash garlic and ginger slightly with the ladle, to produce the spicy juices. Place garlic and ginger inside the chicken cavity. Bring the water to a boil in a pot large enough to hold the chicken. Make sure the whole chicken is submerged. Add the chicken, breast-side down. Simmer, covered, 45 minutes, turning chicken halfway through the cooking process, until chicken tests done (juices from thigh should run clear when pricked with a fork). Carefully remove chicken, drain the liquid from body cavity back into the boiling pot. Plunge the chicken into ice water for 5 minutes to stop the cooking process and tighten the skin. Drain, rub with sesame oil, and let cool to room temperature. For the ginger sauce, put the ginger, oil, salt, and 1 tablespoon of hot chicken broth. Taste and add up to 2 more tablespoons of poaching broth. Transfer to a dipping sauce dish. He then served with boiled brocolli seasoned with salt and pepper. Being Berto’s number one fan, I personally thought the chicken turned out great! Still a little bloody inside, but still delicious just the same. My father, already suspicious of anything boiled, didn't touch the dish, opting to eat the last night's leftover dish.. oh well.